Many years ago we decided to only offer the highest quality mats to our customers. We only sell conservation quality acid-free mats, we no longer carry any paper mats. If you have ever noticed the small bevel on a mat turning a tan or brown color - that's a paper mat. What's happening is the acid in the wood pulp is leaching to the surface. Not only does it look bad, but it's also damaging your art. It doesn't happen overnight, but with time the acids will actually burn your artwork, leaving a discolored edge around the piece. We believe in the philosophy of "do no harm", so for that reason we only use the highest quality acid free and cotton rag mats. 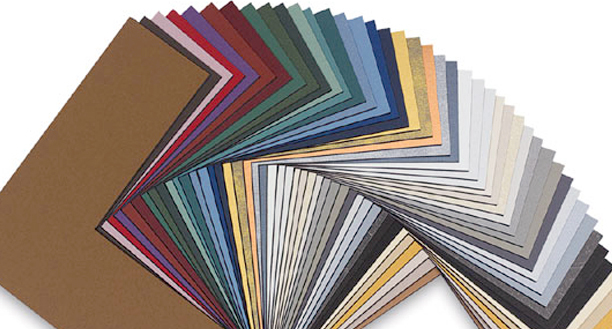 We use Cresent, Bainbridge and Artique matboards, with over 1000 colors between them! This allows us to fine tune the color choices in your design, thus making your treasured items look their best. Here is a example of a Regular Mat (on the left) and an Acid Free Mat (on the right). You can clearly see the discoloration in the core of the Regular mat. In the picture below you can see the damage caused by using a regular mat. Notice the tan oval line around the silhouette. That line has been "burned" into the paper by the acids contained in the oval Paper Mat that had been used in the previous framing. If you look carefully at the bevel on the oval window in the mat you can see that it is discolored. If this were an Acid Free mat it would still be a crisp white and the damage to the artwork would have been avoided.